Rose Haven Farm is back but now in Ecuador. The property is not large, around 1.5 ha. or 3.4 acres but big enough for something. I have been here just over 2 years and when I arrived little had been done here. I had been told that various crops had been planted to add humus to the soil but the result has been minimal. In fact the soil is very sandy, drains quickly, and for much of the year, the climate is dry, although rarely reaches freezing. So what have I been doing? I have long been interested in trying to farm without a lot of chemicals, organically if possible. And in permaculture where we don’t have to till the soil very year. So this is what we have done to date. The first venture was with Isabel and her family planting alfalfa seed exactly like something out of biblical times, scatter seed and use a tree branch to brush in. This was accompanied with a cover crop of barley. Later the barley was hand cut and threshed with a large stick on my porch. But a good bit of the alfalfa has taken so we have two areas with plants, at the rear and then opposite my patio entrance. The next venture came from Isabel as she wanted to start a cuy (guinea pig) operation. Her mother-in-law bought her a cuy house and later she added a second. Then her husband brought back some male cuyes from Peru as these are genetically larger than those found in Ecuador. The cuyes mainly eat alfalfa although sometimes a bit of grass and other greens, so essentially these are organic cuyes, meant for food. Something like rabbit but dark meat and greasier. The cuy manure and plant waste is returned to the fields. Then I had always wanted to have a little lavender operation and since the terrain & climate is dry much like Provence, I thought this might be possible. So I selected a site near my entrance and went to a nearby plant store and bought around 120 plants. Later I discovered these were not the regular lavender but a related plant called Lavendin. Fragrant but not as subtle. However fine for many products. These have now grown well and I have been pleased to see I can get 2 crops a year here. When I had enough plants blooming Isabel and I made some products and showcased them at our local market in Poalo. 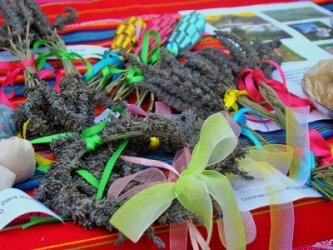 She and I made decorative Lavendin items like wands, swags and wreaths, as well as sashays for drawers while I made some lemon loaves. I intend to keep this going so last August I made cuttings and we now have enough rooted to start transplanting them to increase my production. I will continue to take cuttings, but may buy more. In addition I am thinking getting a plant import licence would be worth investigating, then I can buy “real’ lavender varieties. All my efforts to propagate seed from both Canada and Spain have failed. Separately I have I have been working on fruit, vegetables and flowers. This time the soil is augmented with sheep manure from the hills. With regards to fruit, I now have moras (black berries), tree tomatoes, ground cherries, small wild type strawberries, figs, lemons, mandarins, small apple and pear trees and a newly planted dwarf avocado. In vegetables I mainly try to make enough for myself and some for Isabel. So I have now 4 kinds of lettuce, arugula, spinach, butternut squash, asparagus coming, pumpkins and a calabash squash, yellow peppers, beets, Swiss Chard, cucumbers emerging, and also various herbs: rosemary, thyme, oregano, sage, garlic chives, regular chives, mint and lemon verbena. Flowers are also an experiment here. I always marvel at what I get. Now I can grow Bougainvillea, Calla lilies, gigantic Canna lilies, Vinca that I cannot stop and so much more. I did have a compost bin built and we have already been able to contribute some of this to the vegetable garden. Separately is the issue of water. This is a frequently dry rural area served by an open agricultural water canal. I am eligible for water on a rotational basis but the hours are limited. And site distribution is not easy. I also have a second water option which is water delivered by underground pipes. To this I have set up a sprinkler system but unfortunately this system also has issues, but when it does work, it is good. In addition, around a year ago we had a program here to allow the creation of irrigation ponds, so I now have a large one dug at the area. However, this needs to be completed and is costly - needs membranes, pump and connections and then would be filled by the canal and rain. In time this may get completed. Currently we are putting in a windbreak on the south side as this faces direct strong winds mainly in August and September. 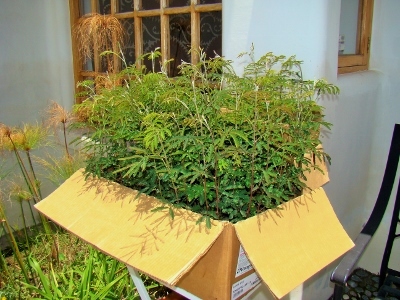 We have selected acacia trees as these seem to grow fast here and need no special care. As money and time permits, I have ideas for more projects – a chicken coop for eggs, beehive for pollination and perhaps lavender honey, quails (cute small eggs), fish in my new pond when completed, more of the local agaves for fibre for textile products and even a kind of liquor similar to Tequila. I always have fun exploring options and so, keep tuned.